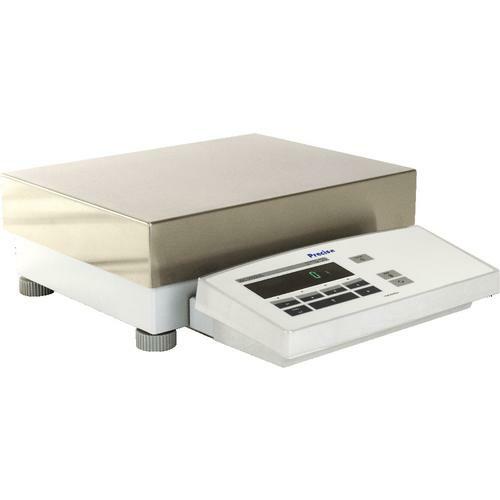 The Precisa IBK 490 Series range of industrial scales stands for outmost Swiss precision. Built for all areas of industrial weighing where high precision is required. Exceptional performance features and built-in automatic self calibration system gives users full confidence in achieving accurate weighing results – approved and certified. The finest electro-magnetic force restoration system, which conforms to the highest metrological standards, secure that all weighing results are absolutely reliable. User-friendly indicator. Standard keyboard layout with 10 keys. 4 freely definable function keys. Large digital display, 20 digit display information line. Vacuum fluorescent display. Weighing-in guide +/- Applications included: weight unit switching, counting, percent weighing, net totals, check weighing, animal weighing, totalisation, statistics, calculation, area weight calculation, Multi-User Memory (MUM). Counting: advanced parts counting with multiple memory functions Extended counting and storage functions with 1000 product storage positions, 250 stored tare-weights, nominal and tolerance values. Totalization, definition of print format, memory protection. SCS fully automatic self-calibration system The PREMIUM 490 Series is equipped with a fully automatic time and temperature controlled internal calibration system (SCS). The SCS can be set to provide regular calibration at predetermined times or temperature changes in accordance with ISO and GLP guidelines. Additionally external calibration can be achieved via the Intelligent Calibration Mode (ICM) with a choice of external weights. IP65 Protection The PREMIUM 490 Series is available with IP65 industrial protection as an option. IP65 protects against ingress of dust and water splashes. The balance is fitted with a protective keyboard. 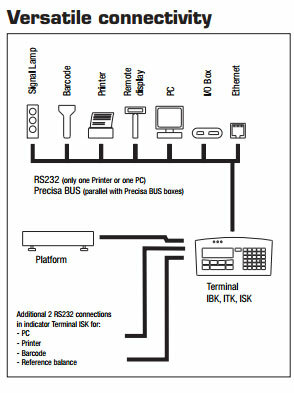 Connectivity The standard interface can work as RS232 or as Precisa BUS.